This subtly flavoured main course is a classic Zen Buddhist dish, found in most Japanese restaurants. Serves 4. 1. Wipe the konbu with moist kitchen paper and cut into strips. 2. Steep the konbu and shiitake in a saucepan of water and let soak for at least one hour, preferably overnight. Then bring gently to boil over low heat. 3. Just before the water reaches boiling point, the konbu will rise to the surface. Remove it and discard. 4. Increase the heat and boil the stock quickly for 2 minutes. 5. Set aside to cool at room temperature. Then remove the mushrooms, and strain the liquid. 6. Drain the tofu on kitchen paper for 30 minutes to 1 hour, taking care not to break it. The pieces should be thoroughly dry. 7. Heat the dashi, soy sauce and mirin in a saucepan, but do not boil – keep the mixture simmering at a very low heat, just below the boiling point. Remove from heat, cover, and set aside. 8. Sprinkle the flour evenly on a plate, and roll the tofu slices until they are evenly covered with the flour. 9. Meanwhile, heat the oil in a deep-fryer until very hot but not smoking. Fry the tofu until golden brown, and drain on kitchen paper. 10. 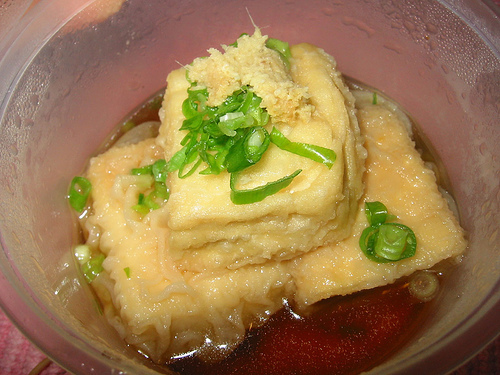 Place the tofu in 4 individual serving bowls, and ladle over the dashi. 11. Garnish with ginger, spring onions and sesame seeds, and serve hot with rice, vegetables and Japanese pickles.